This week I’m installing Andersen architectural windows in a house from the 1800’s (as many homes are here on the Massachusetts North Shore. 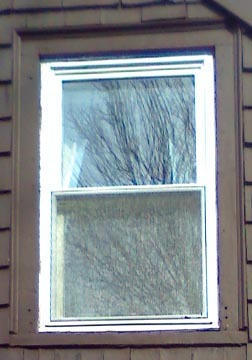 Years ago the owner replaced a few of the windows with Andersen 200 series (available from Home Depot) and installed vinyl window inserts in the others. These three photos show the difference in appearance and quality. 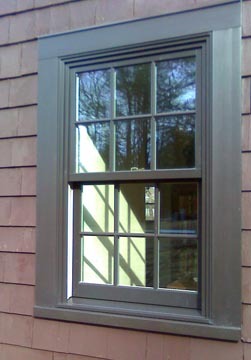 Installed: new Andersen Architectural Series windows with snap-on casings. Those windows (frames, sashes and casings) are being completely replaced with beautiful Andersen 400 Woodwright Architectural series windows. Andersen’s new pre-manufactured exterior casings offer several appearance options, from the brick molding of the 50’s to wider 4″ traditional casing shown here. Assembled and applied in the factory, the casings are easily removed for installation, held in place by a hooked extension on the wide nailing fins. The rough openings in this old house had no headers or sills, just a cut-out in the framing and wall. After framing for the new windows, I traced a line for the outside edge of the casings and cut out the shingles with a cordless circular saw. 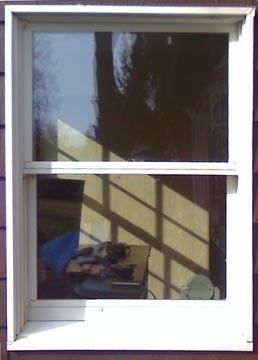 The Andersen 200 series insulated windows that were installed years ago have also held up, but the “narrowline” frames were not designed with wide casings in mind. If you prefer to make your own casings, PVC boards look like wood. They are considerably more expensive but will last forever and hold paint well. Pine boards will not last long outside. If you prefer wood, use cedar. The video below shows vinyl boards being installed around Andersen narrowline windows.